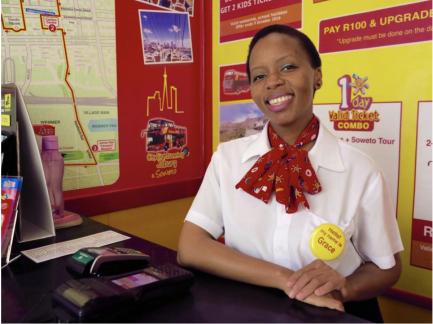 City Sightseeing's friendly ticket-office staff are on hand to help you. 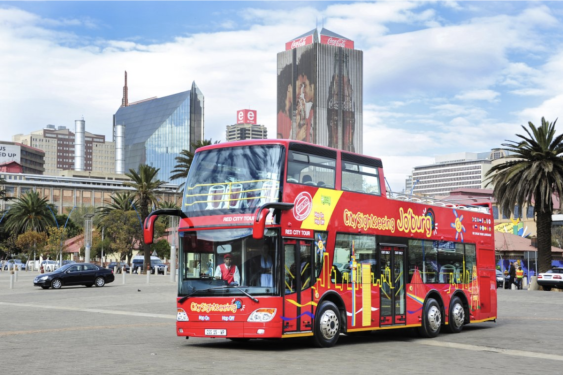 Whether you’re a tourist eager to explore Johannesburg’s sights or a local looking for a fresh and novel way to see your own city, City Sightseeing’s open-top red bus and Soweto shuttle tours offer you the best vantage point from which to experience Jozi’s unmatched urban buzz. Along the way, you’ll discover that there’s more to Joburg – which originated as a mining town in the 1880s – than you may have thought. The City of Gold is also the city of trees and parks, the city of historical milestones, the city of shopping and fun, the city of scientific discovery and artistic innovation, and the city of sunshine and outdoor leisure. It’s an always-on-the-move melting pot of diverse cultures and influences, steeped in a fascinating and often troubled past. 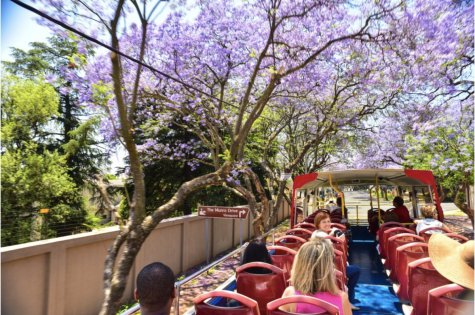 By hopping on a big red bus and enjoying a bird’s-eye view of Joburg’s many attractions, you’ll be perfectly positioned to absorb all the sights and sounds, the colours and flavours, and the cosmopolitan energy of South Africa’s vibiest city. Start your Joburg bus odyssey at the Rosebank Gautrain station on Oxford Road (use the north exit once you disembark from the train) and head to the city sightseeing office at The Zone @ Rosebank shopping centre (shop KI04), located in the Tyrwhitt Avenue pedestrian walkway next to the Hamleys toy store. The bus departs from Cradock Avenue every 30 minutes between 9am and 3.10pm daily. If required, a free shuttle bus will take you to the Rosebank Gautrain station from these hotels and venues: Protea Hotel Fire & Ice, African Pride Melrose Arch Hotel, Radisson Blu Hotel, Sandton Convention Centre, Protea Hotel Balalaika Sandton, Hilton Sandton and The Maslow. Fighter planes and tanks are on display at the military history museum. Your introduction to one of the largest man-made urban forests in the world starts here! 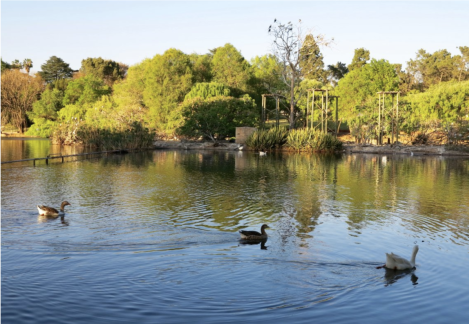 You’ll have a great view of the spectacular greenery from atop the open-top bus, as you wend your way through the leafy suburbs to Zoo Lake (a tranquil picnic spot where you can feed the ducks, paddle on the lake or dine at the restaurant next door). Hop off and on again as many times as you like as you visit the Johannesburg Zoo (home to the Big Five and many other species), the Ditsong National Museum of Military History (tracing South Africa’s involvement in major conflicts), and Constitution Hill (once home to South Africa’s most notorious apartheid-era prisons, now the seat of the Constitutional Court). From Constitution Hill, you’ll transfer to another bus for the City route. Buses depart from Constitution Hill between 9.45am and 3.55pm daily. You can also begin your sightseeing tour here, and transfer to the Green Tour afterwards. The bus will take you into the heart of the Johannesburg city centre, where you can explore the mining district (a “living museum” where South Africa’s powerful Randlords, the mining magnates who oversaw the Witwatersrand mining boom from the late 19th century, once held sway), the Carlton Centre (offering a panoramic vista of the city from its 50th-floor “top of Africa” viewing platform), before heading to the James Hall Museum of Transport (Africa’s largest transport museum). Braamfontein pulses with a youthful and hip urban buzz. From there, you can hop off at Gold Reef City Casino and Hotel (an entertainment mecca, where you can have a whirl on the slot machines and tables) or the Apartheid Museum (which powerfully and poignantly recounts South Africa’s troubled apartheid past; you can access the Gold Reef City Theme Park from this stop too). Then you’ll make your way to Newtown and the SAB World of Beer (enjoy a tour and a refreshing pint at this museum, across the road from the fascinating Sci-Bono Discovery Centre and the Workers’ Museum), and then the Newtown Junction shopping centre and the Work Shop New Town African design emporium, a short walk from Museum Africa. Do also make time to explore Braamfontein with its trendy shops, galleries and restaurants, and the Neighbourgoods Market on a Saturday, before heading back to Constitution Hill. For an authentic taste of South Africa’s most famous township, add a live-guided tour plus a free walking tour of Soweto to your City Sightseeing trip – we guarantee it will be unforgettable. 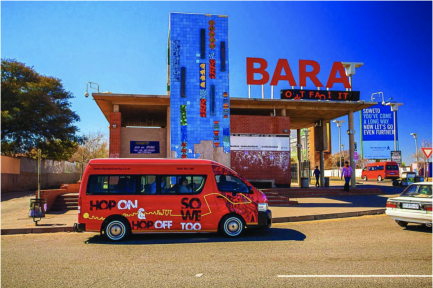 The Soweto tour runs every 60 minutes from 10.05am to 3.20pm daily, departing from the bus stop at Gold Reef City Casino and running for two hours (excluding exploration time). Climb on a minibus taxi to the impressive FNB Stadium, fashioned in the style of a “calabash” or traditional clay vessel (and known as Soccer City during the 2010 FIFA World Cup), before travelling through the diverse neighbourhood of Diepkloof en route to Chris Hani Baragwanath Hospital, one of the largest hospitals in the world. You’ll pass the bustling Bara Taxi Rank, before heading to the iconic Orlando Towers, a colourfully decorated landmark where the brave of heart (and stomach) can do bungee jumping, base jumping and abseiling. Disused cooling towers in Orlando have been repurposed into a funky adventure zone. After driving past Orlando Stadium, you’ll arrive at the Hector Pieterson Memorial and Museum in Orlando West – commemorating the 1976 Soweto uprising during which many schoolchildren lost their lives. Enjoy traditional cuisine at one of the restaurants on Vilakazi Street, the only street in the world to have been home to two Nobel Peace Prize winners (former president Nelson Mandela and Archbishop Emeritus Desmond Tutu), before taking in the Kliptown Open Air Museum at Walter Sisulu Square, which revisits the signing of the seminal Freedom Charter.